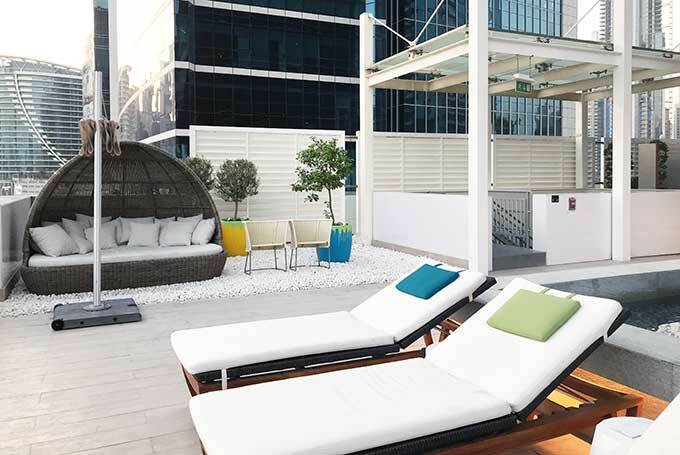 The Renaissance Downtown Hotel, well located luxury accommodation downtown Dubai. Large comfortable rooms in close proximity to Burj Khalifa, Dubai Mall and Dubai Fountain. 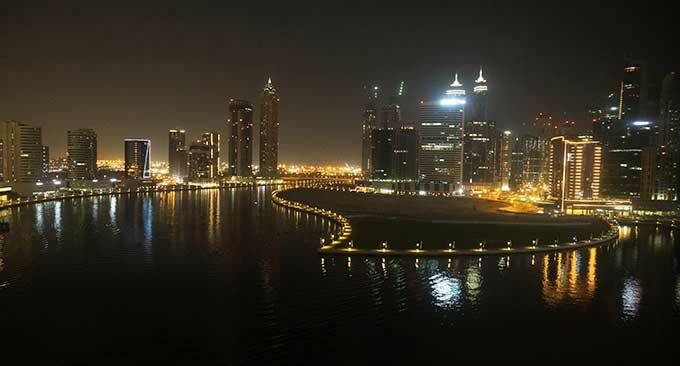 Some rooms even have sweeping views of Dubai Water Canal. 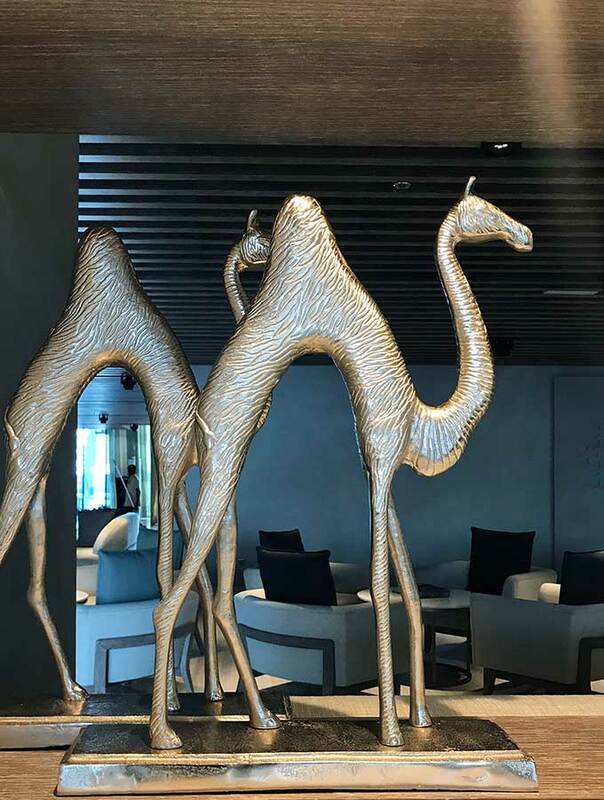 After spending my first few days in the UAE at Bab Al Shams, an incredible luxe hotel located in Dubai’s desert, it was time to spend a few nights in Dubai city. 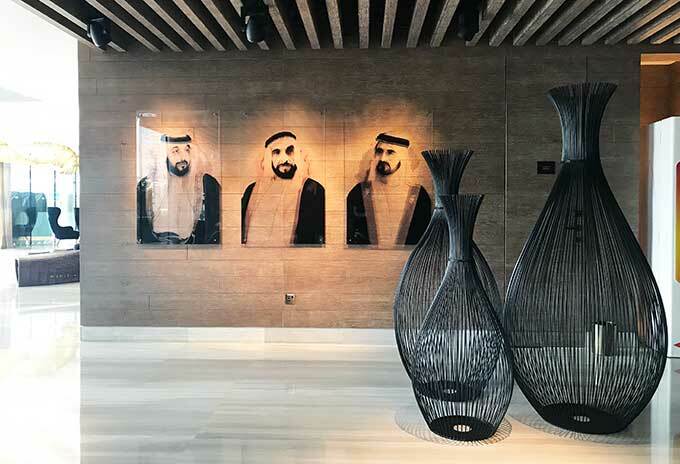 A complete change of pace at the Renaissance hotel in downtown Dubai. I’m warmly greeted by the well dressed doorman and relieved of my bags. Check in is pleasant and relatively quick. 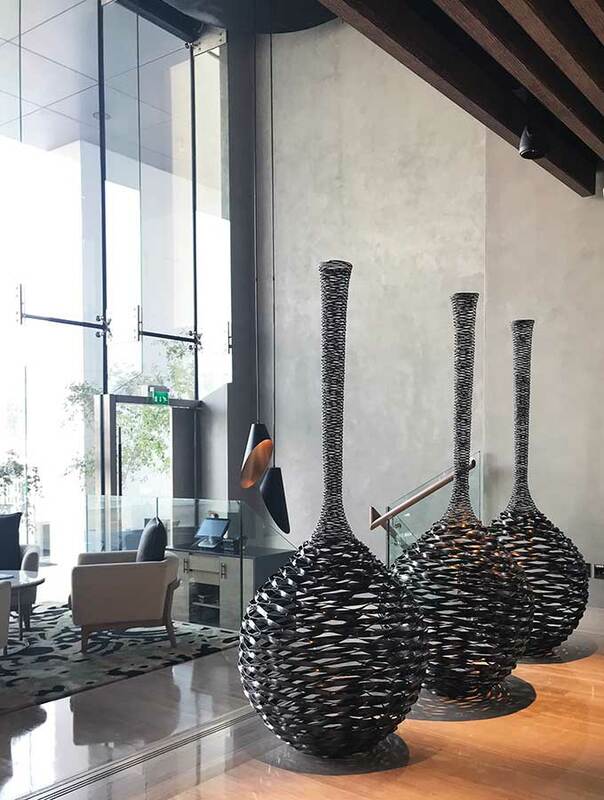 The hotel lobby is light, bright and airy, filled with small sculptures and various artworks. There are two stand out pieces of art. 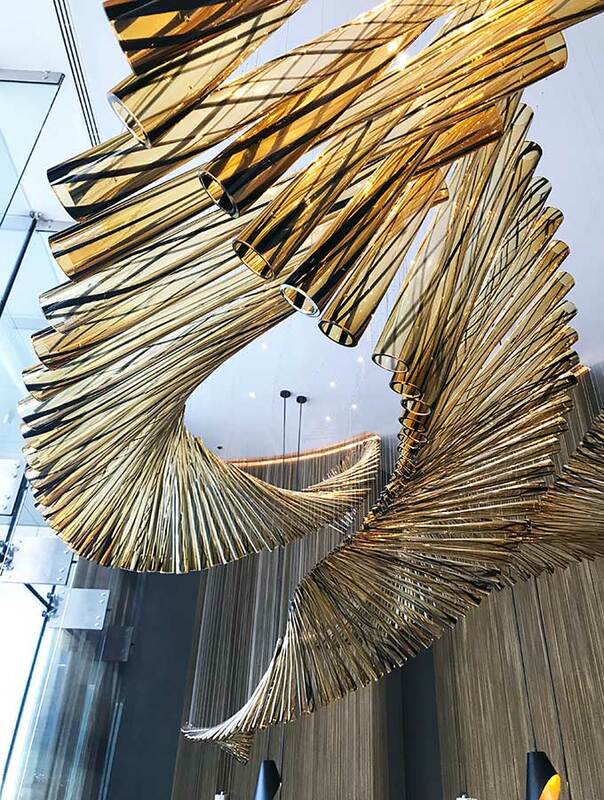 One is a brass cut out of the Dubai skyline, which greets you are you enter the hotel. 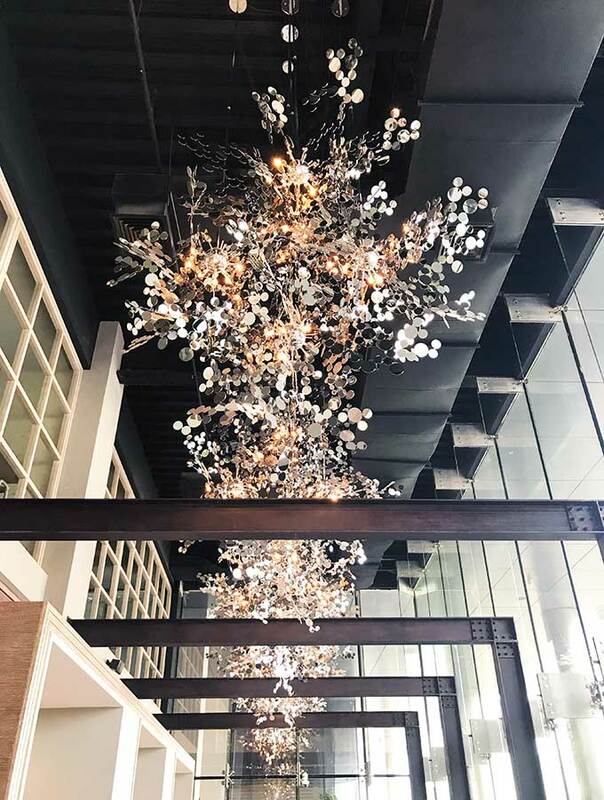 The other is a large outstanding sculpture that floats above your head in the lobby. What is hard not to notice is the lack of people around. The general buzz that a hotel lobby tends to have. I am putting this down to Ramadan. 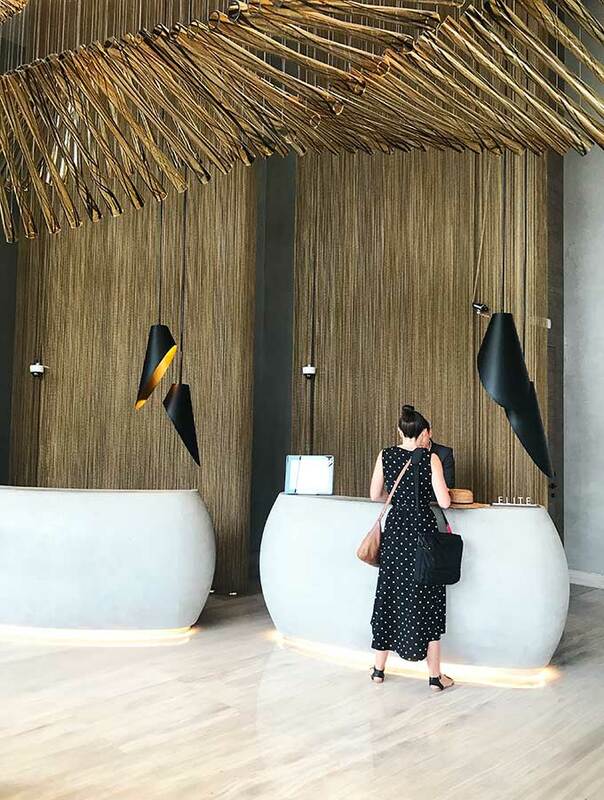 Normally you find people have a coffee or a drink in the lobby bar/café, generally hanging around, or coming and going from the hotel. There is none of that, not a soul around. But Gwen isn’t where the celebrities end for Renaissance Downtown Hotel. 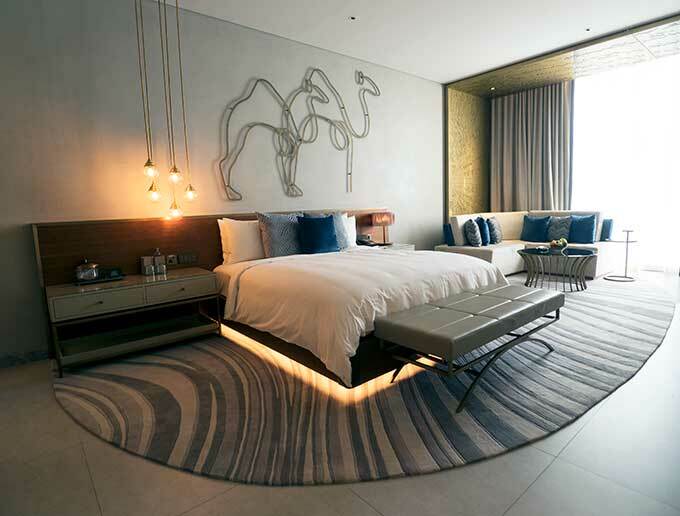 Celebrity chefs have also made this downtown Dubai luxury hotel their home. The most notable is Iron Chef Masaharu Morimoto with his restaurant Morimoto Dubai. The restaurant positions itself on the 23rd and 24th floor of the hotel. There is a bar, teppanyaki and sushi counters. 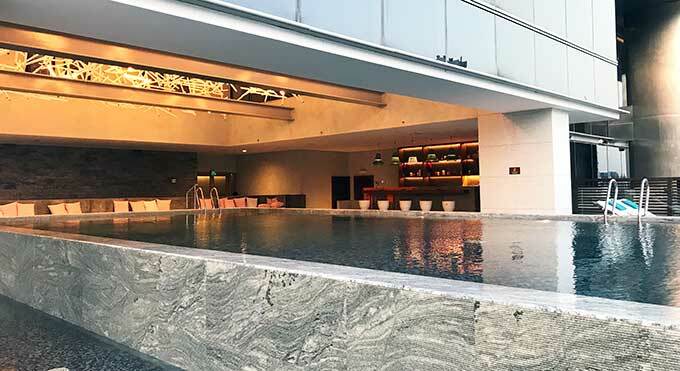 There are four unique terraces, ranging from a large terrace with its own outdoor bar through to an intimate private terrace with incredible views of Burj Khalifa. The other celebrity chef is Michelin Starred, American born, David Myers. Myers has three establishments at the hotel. Two restaurants, BASTA! and Bleu Blanc, plus a hidden speakeasy called Poppy. 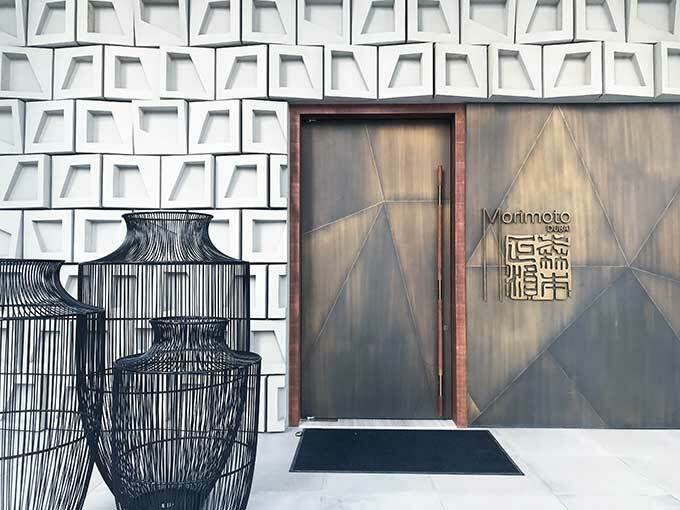 Sadly, I didn’t have the chance to visit Morimoto Dubai, Bleu Blanc or Poppy. I’m saddest about missing out on Poppy, but if you are looking for it you will find it hidden away behind a door marked private. Where is the Renaissance Downtown Hotel anyway? 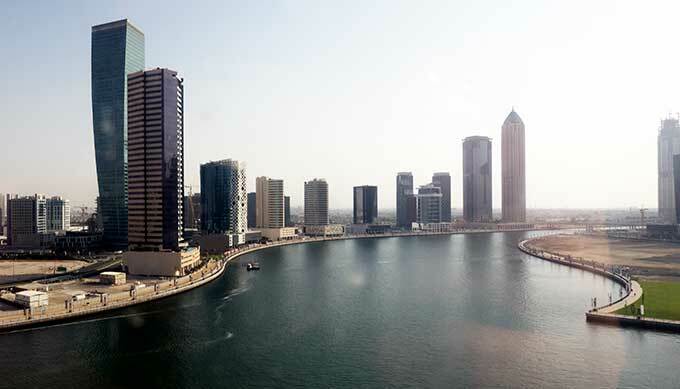 The hotel is located on the shores of the Dubai Water Canal on Business Bay, downtown Dubai. 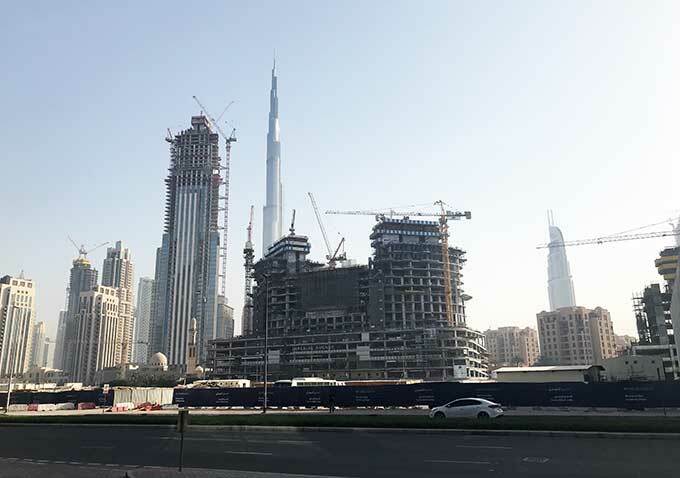 You are in close proximity to Burj Khalifa, Dubai Mall and Dubai Fountain. For opera lovers the Dubai Opera is also in the area. 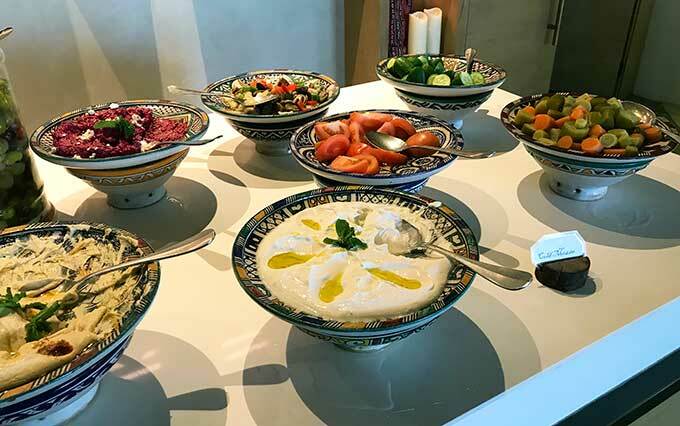 You are centrally located for great food, especially if you want to do a Dubai food tour. It’s also a great location if you want to get your dancing shoes on for a big night out. 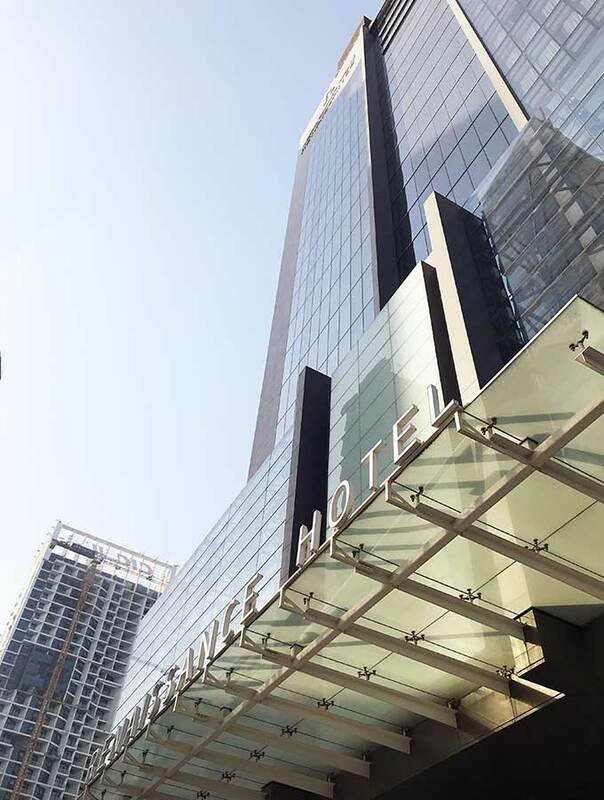 What’s the accommodation like at luxe downtown hotel? I stayed in a deluxe hotel room (room #1004) which has sweeping views over the canal. During the day it doesn’t look like much, sand, dust and buildings. But once the sun goes down, the lights come on and it is one pretty view. The room was large, plenty of room to dance if you felt the urge. A comfortable king size bed, space to work, large television, lounge, and coffee table with a bowl of fruit. 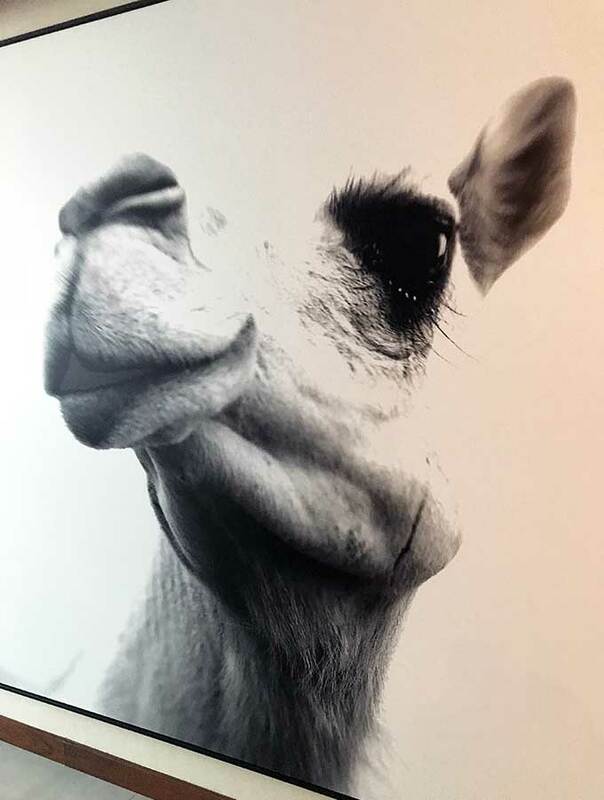 One of my favourite features of the room was the wall size photo of a camel’s head (those eye lashes!). It greets you as you open the door and walk up the hall to the main room. There was also a large walk in wardrobe complete with Koran (Qur’an) and prayer matt. If you get the munchies there is a mini bar, snacks, coffee and tea. The bathroom can be as open or as private as you wish. A large sliding wooden door gives privacy when closed from the main area of the room. 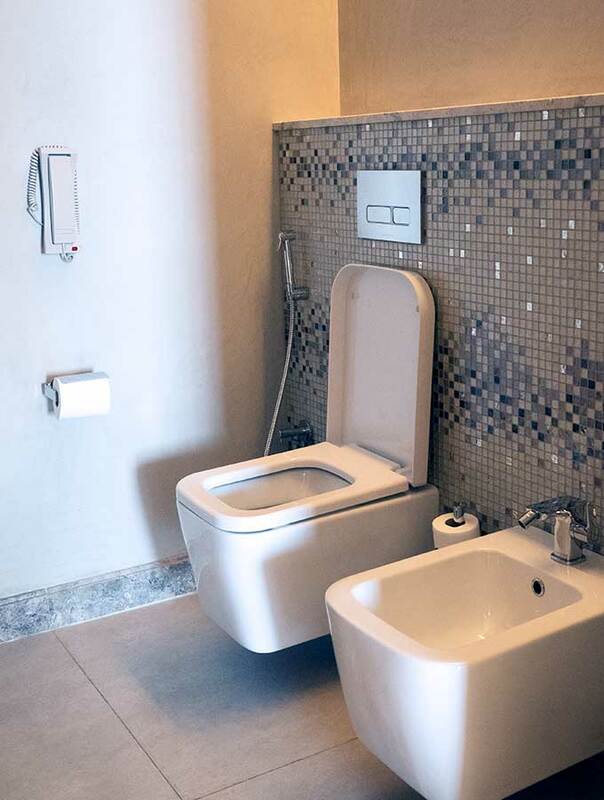 The toilet is in its own small room with a closing door. 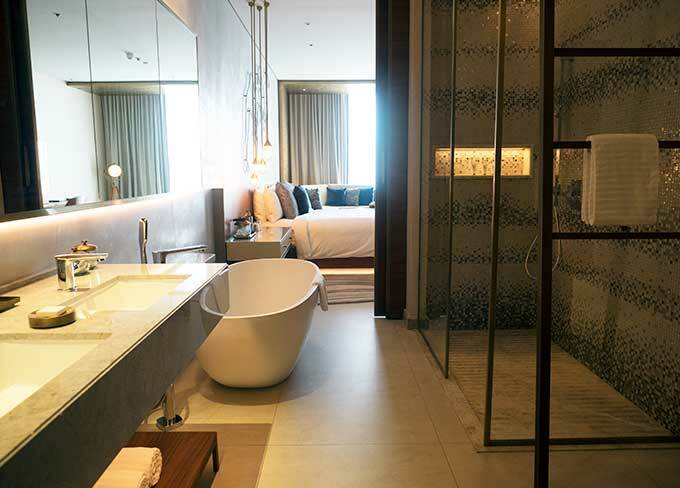 The large bath and walk in rain shower complete the luxe feeling. As I was staying during Ramadan the hotel kindly provides a fact sheet for guests in their room. A quick run down of how not to get into trouble or offend anyone during your stay. It also outlines the hotel’s special events for Ramadan. Fun times to be had at the hotel? If you are after a little R&R there is Six Senses Spa, where you are able to mix your own aromatherapy oil for your massage in the Smell Suite. 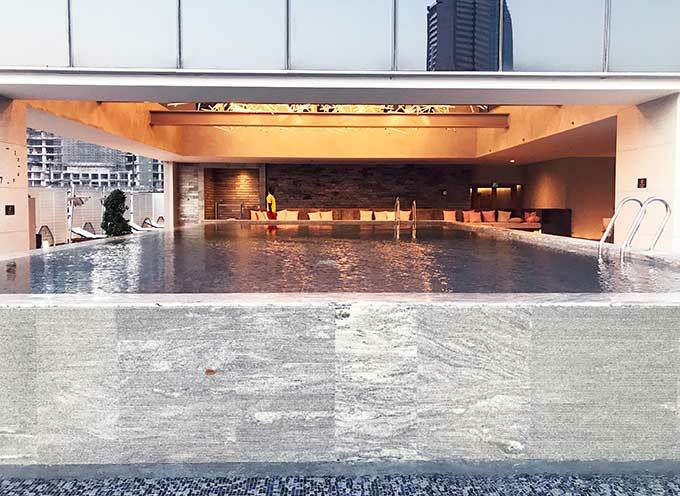 For those wanting to be a little more active there is a well fit out gym, sauna and an outdoor pool. The hotel has bikes for hire. If the heat hasn’t killed you, you can cycle the 12kms of cycleway along the Dubai Water Canal which is on the hotel’s doorstep. 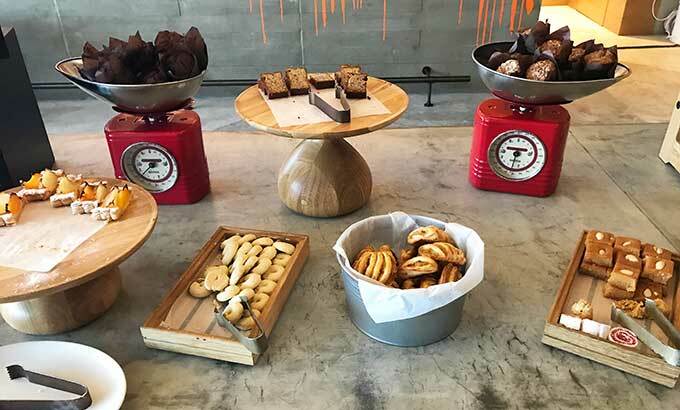 How is the Renaissance Downtown Hotel going to cure my belly rumbles? 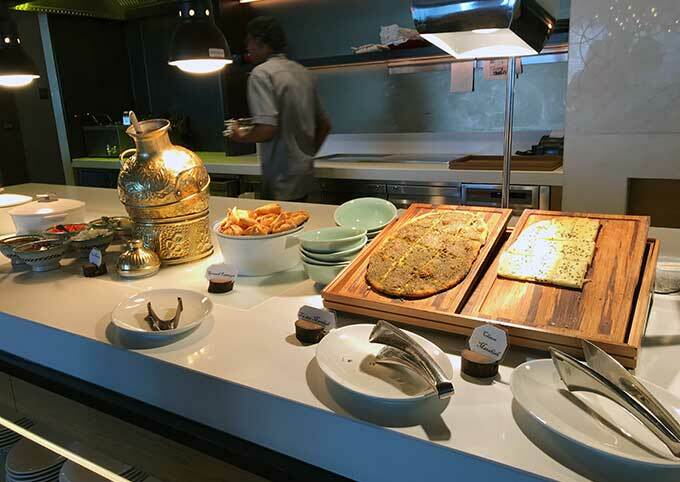 When not discovering the culinary delights of Dubai your stomach will be well taken care of. The hotel has four restaurants, a café and hidden speakeasy. 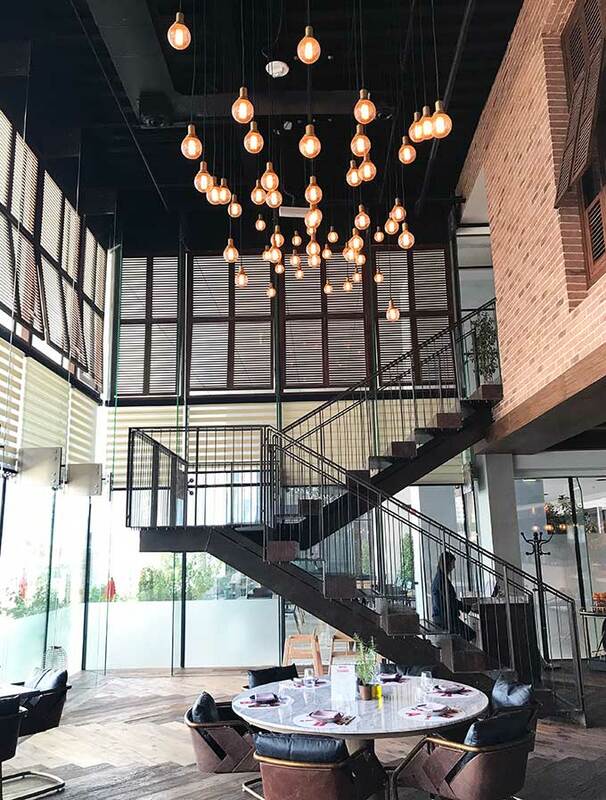 I dined at BHAR and BASTA! during my stay. 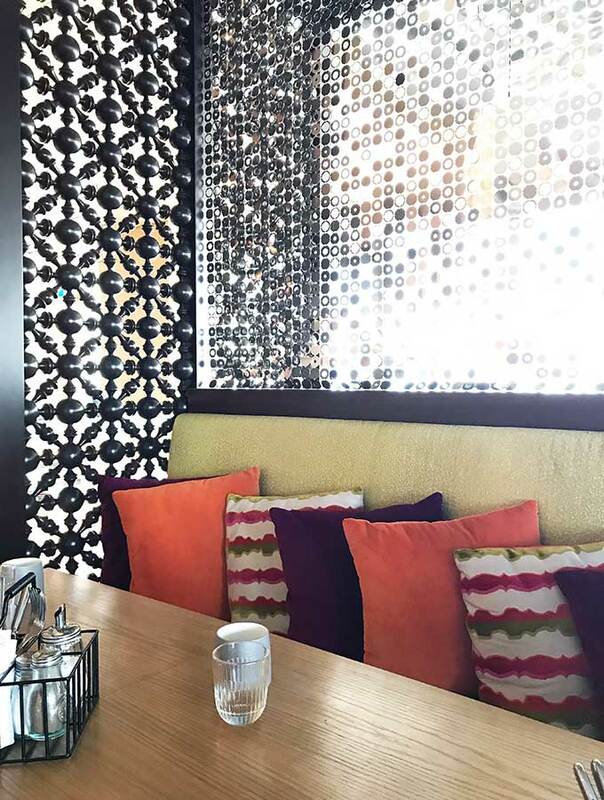 BHAR is the hotel’s Middle Eastern style brasserie overseen by Chef Mohanad Alshamali. It’s a friendly, casual buffet style restaurant. This is where you will be eating breakfast if eating at the hotel. 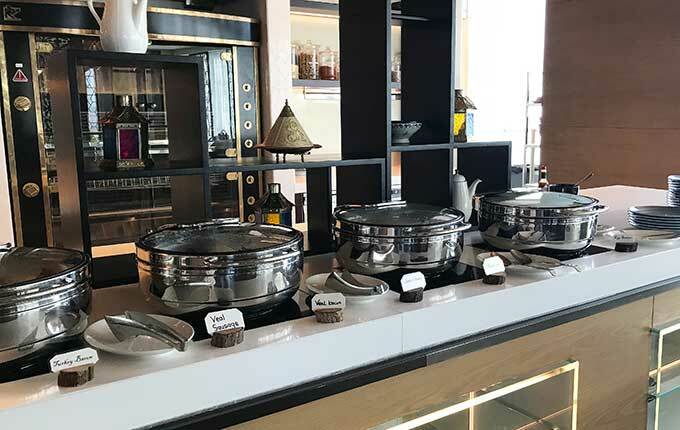 There are a wide variety of dishes on offer for breakfast. 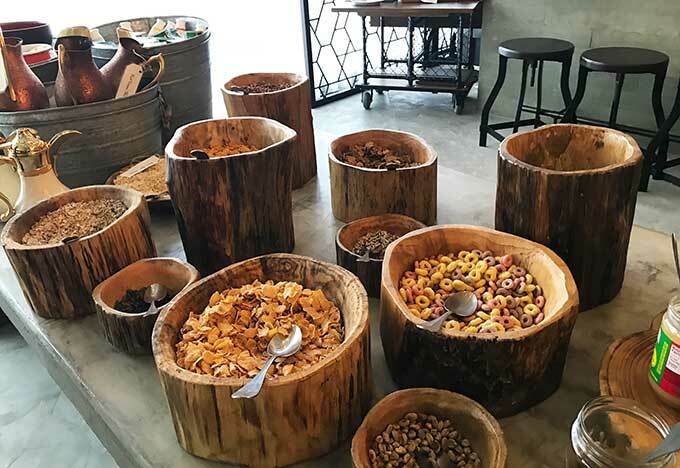 From western style breakfast staples like cereal, danishes, bread, cheese through to Middle Eastern offerings. If you are wanting to try alternative “bacon” BHAR is the place to do it. 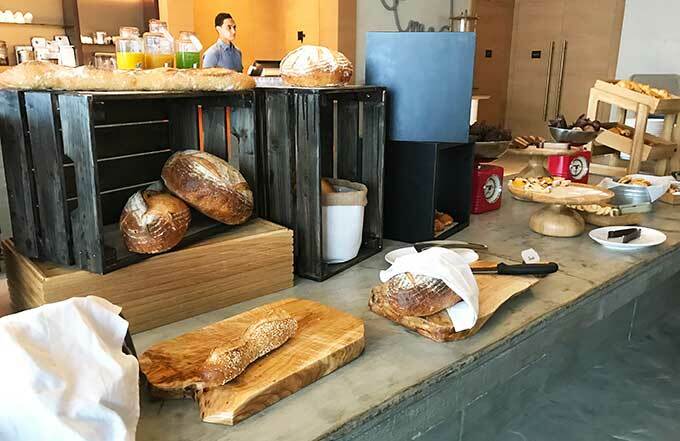 Regular bacon is not offered as part of the breakfast buffet, which is normal. Instead you can taste test turkey “bacon” and veal “bacon” to see which one you think is the winner. 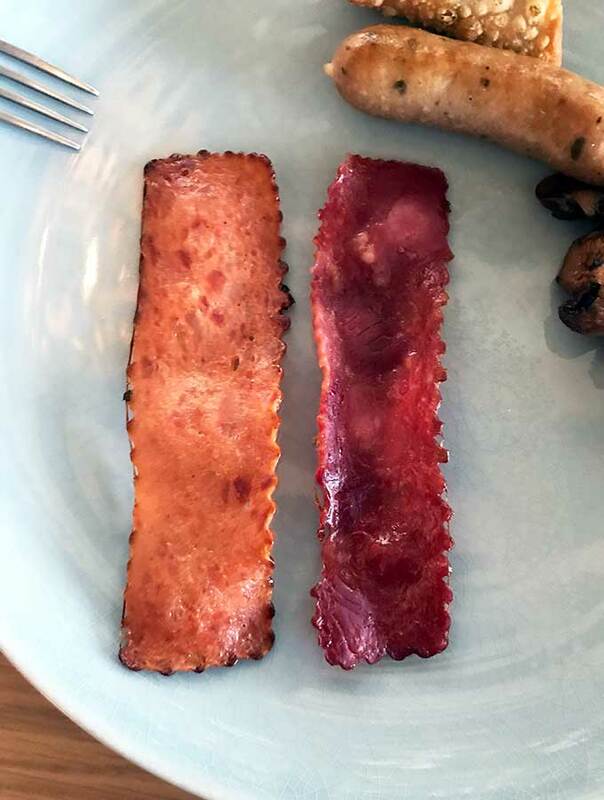 Of course neither come close to real bacon, but if I had to choose one, turkey bacon (one on the left below) is the winner for me. BASTA! is one of David Myers’ restaurants at the Renaissance. 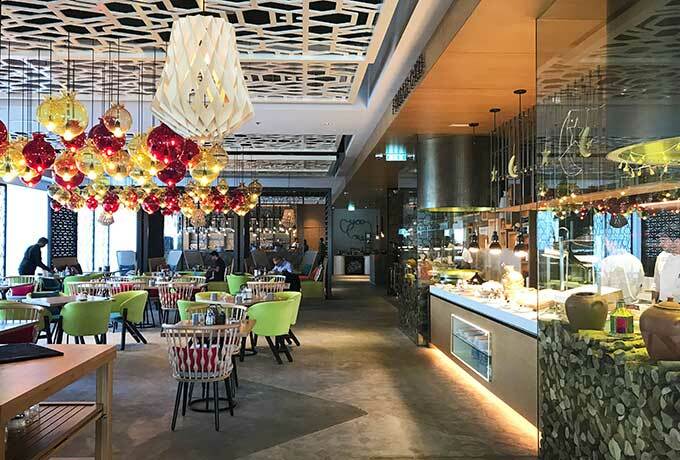 They have fused the food and feel of a Roman trattoria, Florentine steakhouse and Neapolitan pizzeria. The end result is BASTA! 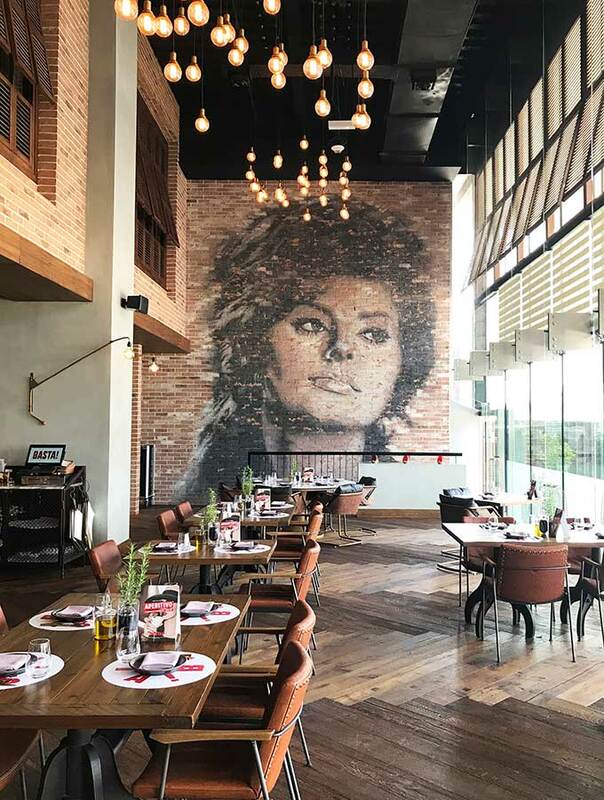 Complete with a two storey mural of Sofia Loren on one of the brick walls. 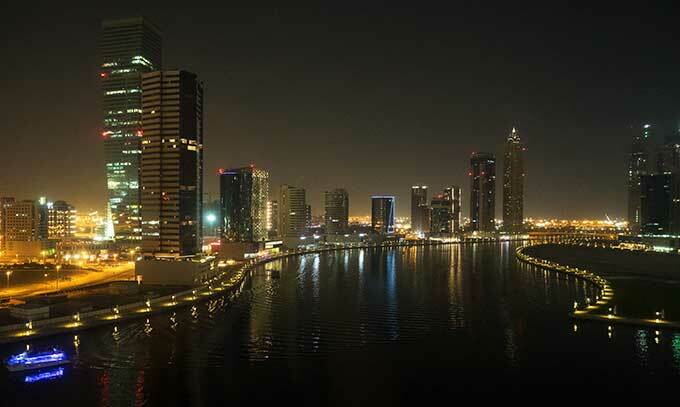 The restaurant is in prime location on the Dubai Water Canal. My fellow diners and myself are the only ones in the restaurant when visiting. We feel quite conscious and a little funny eating lunch as it is Ramadan. Of course we are made to feel welcome and quite at home by the staff. 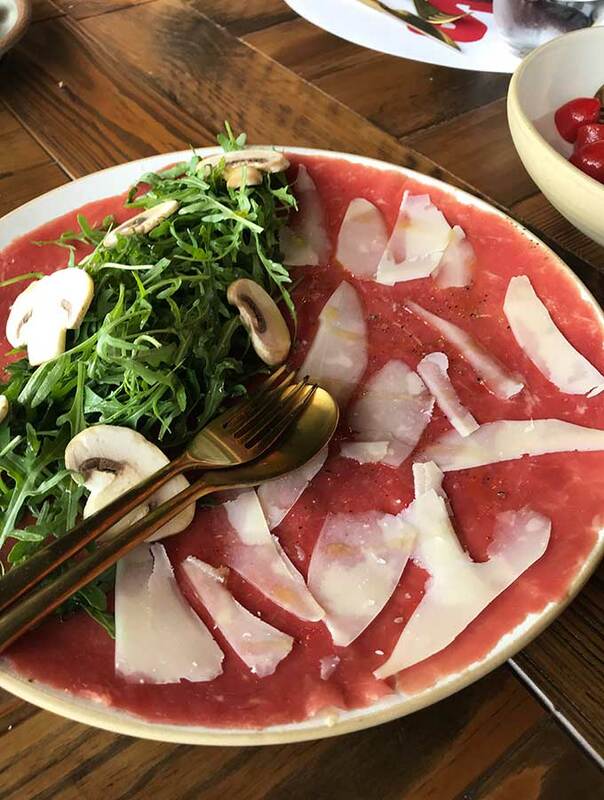 The beef carpaccio is cut paper thin and almost melts in your mouth. It is topped with shaved raw mushrooms, rocket, parmesan and lemon. 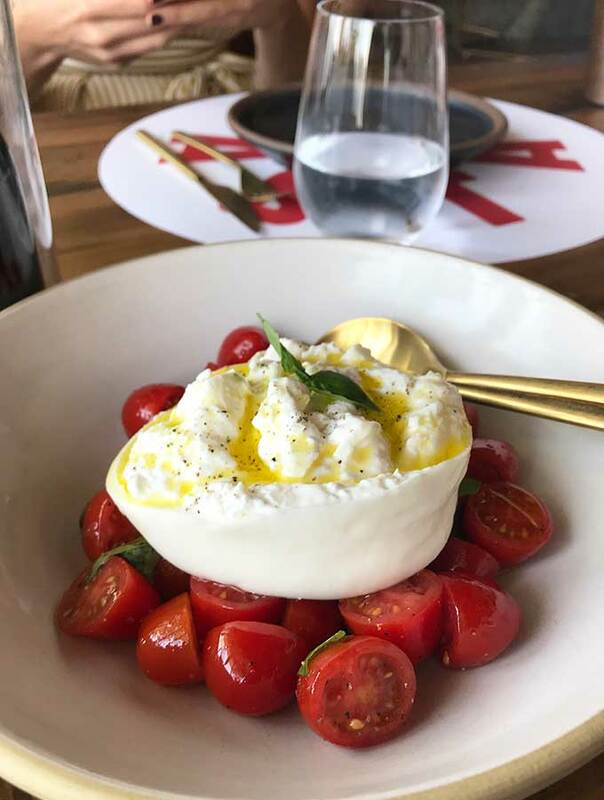 My favourite of our chosen starters is the burrata with cherry tomatoes and basil. The tomatoes are shining stars of vibrant colour and taste. There is no lacking in flavour here. The burrata is simply drizzled with a little olive oil and that is all this dish needs. I could have happily eaten the entire dish myself. Let’s start with the main I ordered, Veal Scaloppine ‘Milanese’. As you can see from the below it was a cutlet, not ‘scaloppine’. This was disappointing, as it was a thick veal cutlet, and not the thin schnitzel style scaloppine I was expecting. The veal also had a rather strange taste to it. Nothing wrong with it, just not what I am use to when it comes to veal. By the size of the cutlet I would hazard a guess the veal had moved into yearling territory. The side of caper lemon butter sauce was delicious, that wonderful combination of butter and tang. 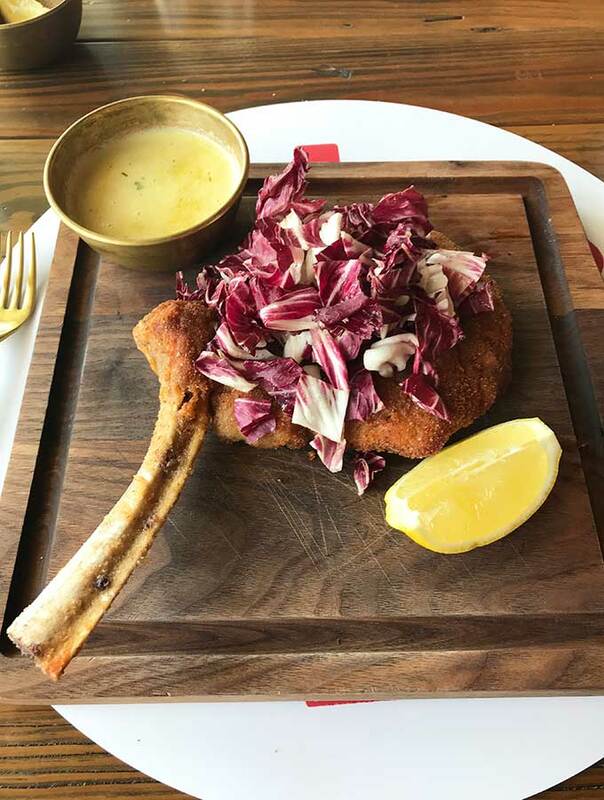 The chopped radicchio salad dancing on top of the veal cutlet added a flavour change. I often get food envy, and I had a major dose of it over lunch. I was tempted by one of the specials of the day but passed it up for veal. 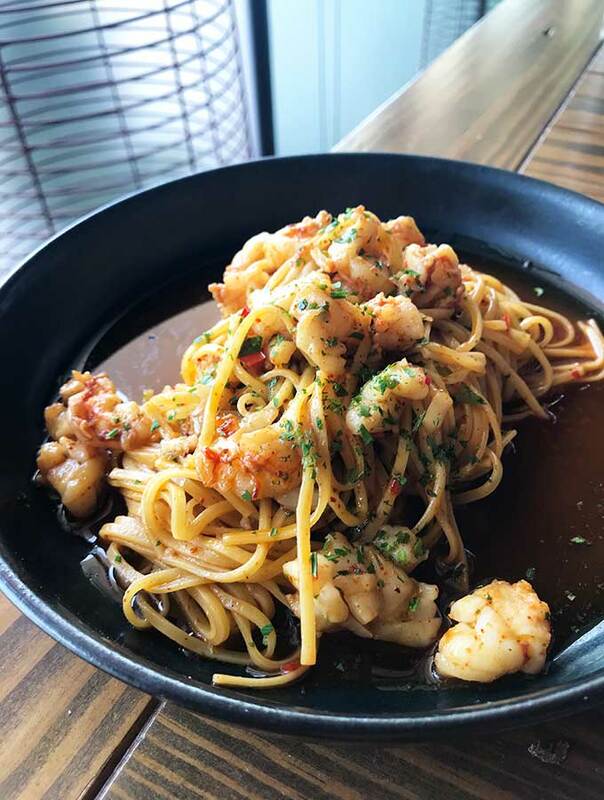 King prawn tagliolini with chilli and garlic oil. Super tasty with the pasta cooked to al dente perfection. I looked on lovingly as my dining companion devoured the lot. Why should you stay at the Renaissance? 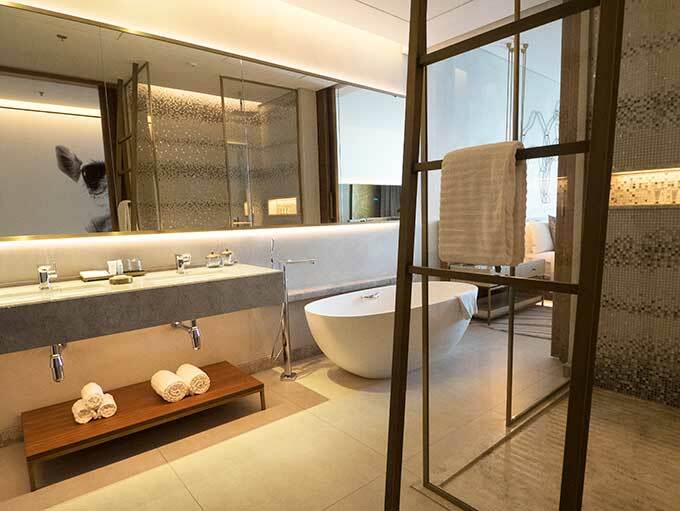 If you are after a luxury downtown Dubai hotel then the Renaissance Downtown hotel is for you. It’s all about location, and you are close to shopping, major sights, restaurants and nightlife. My big rookie mistake during my stay! There was an expensive incident at the hotel which did dampen my stay. In one way it was a very rookie traveller mistake, and I am kicking myself for it. I am so use to local phone calls being included or charged at a nominal rate (especially at a high end hotel) that I just didn’t think. If I had wanted to check, phone rates are not in the room in any case (I checked this after being charged as I was curious). I had to call Emirates Airlines regarding my flight home. I had run out of credit on my Dubai sim card and hadn’t at that stage activated my mobile phone provider’s special daily roaming flat fee. My hip pocket was slapped with a whopping AED 168.00 for my call to Emirates, equivalent to A$70/US$48. I did complain as I thought it must have been a mistake, it wasn’t. The hotel did end up giving me a 25% discount on the phone call. I suggest steering a wide berth of the room phone during your stay. 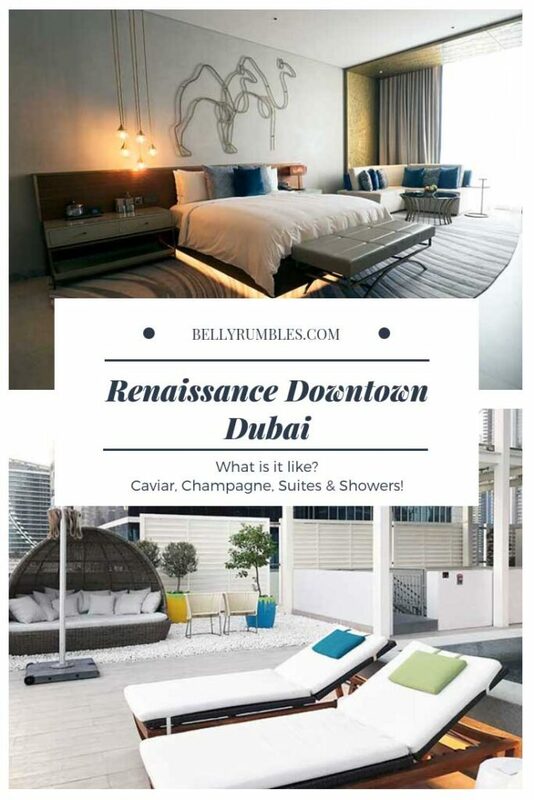 Belly Rumbles stayed as a guest of Renaissance Downtown Hotel and Dubai Tourism, but all opinions remain her own. Become a subscriber and don’t miss a single delicious recipe, restaurant review or travel adventure. Very nice post with nice photos. Cultural important are just shining here. Thanks for sharing. Wow, it looks like the Renaissance is well versed in luxury and relaxation. 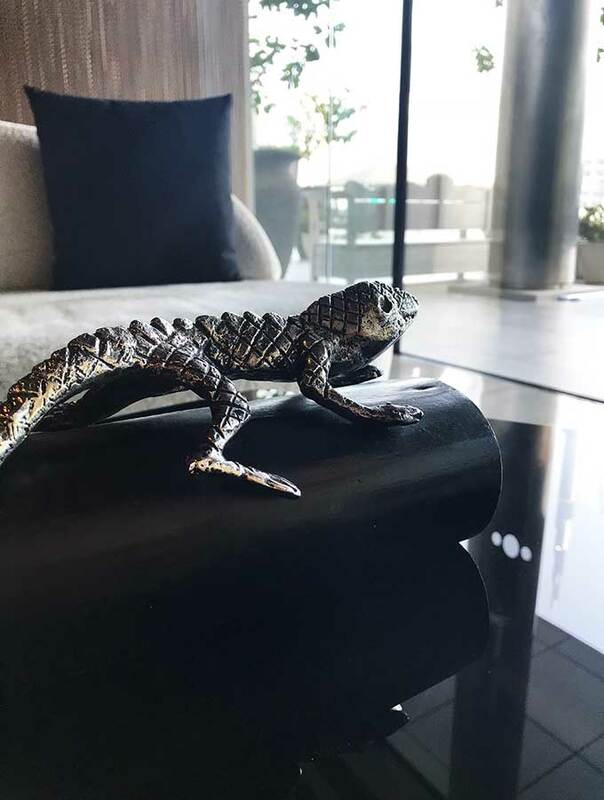 I love all their modern decor and the gorgeous view of the Dubai city skyline at night. 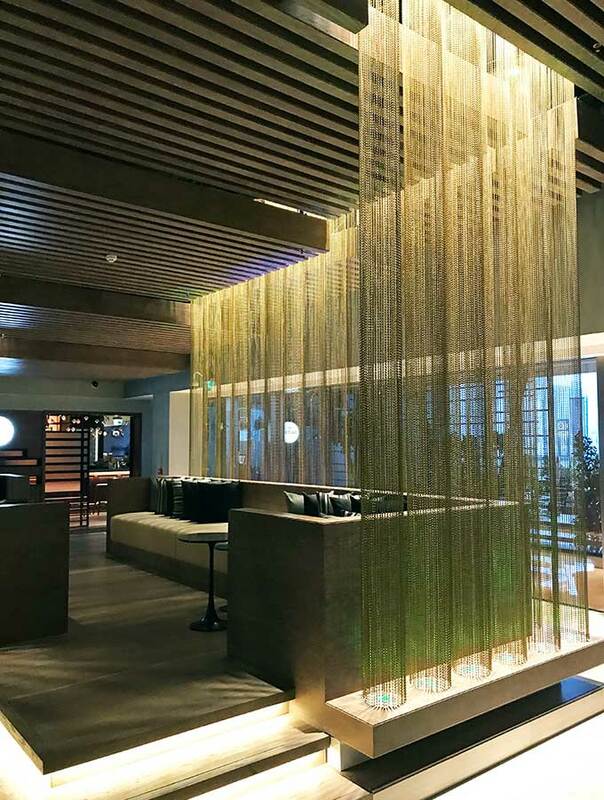 Firstly, what a stunning hotel lobby, I love bright spaces! ? You definitely had a stunning view of the canal. 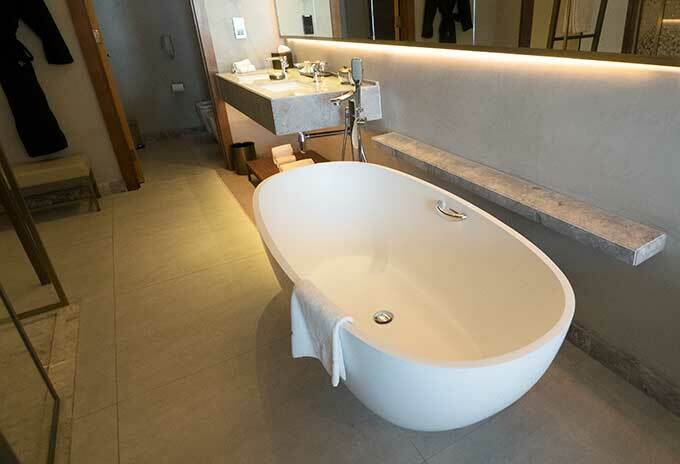 Everything about the room is gorgeous but I especially love that bath and I could also happily eat the burrata with cherry tomatoes, because it looks absolutely divine!! ? I really liked the look and feel of this hotel. Tripadvisor just doesn’t give the same impact? 🙂 The wall decor and design elements are stunning. Would love to stay here when we visit Dubai next. Beautiful place and that room especially (camel lashes!) 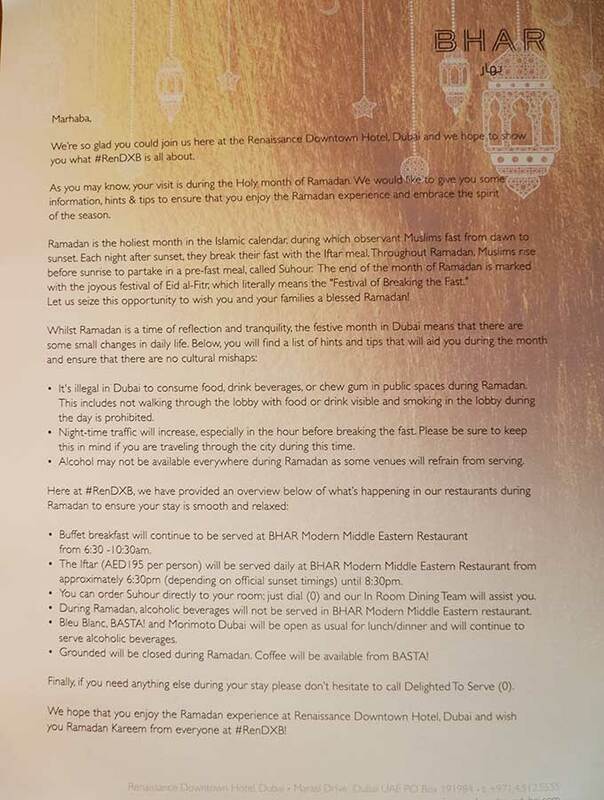 Interesting about the restrictions during Ramadan but I’m impressed with the careful tips sheet. The view was amazing and you’re right – so much better at night. It’s a luxurious place for certain. 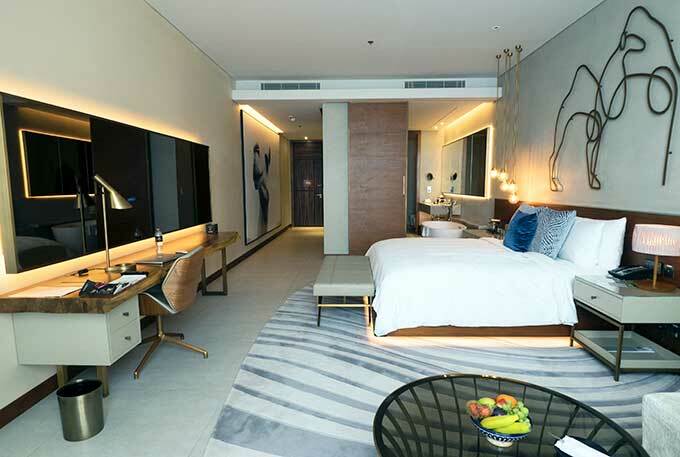 The Renaissance Downtown Hotel in Dubai looks like a great base for a visit in the city. I’m an opera fan, so this would be perfect to me. I can’t remember the last time I used a hotel phone, so I can guarantee I would’ve been stuck with those same phone charges! This made me almost drool! I have a thing about staying at luxury hotels and five star spa. I will definitely stay here when I have a chance! Of course, the food. How can I unsee these delicious dishes you ate? Whoa! This seems royal! I really loved the decor elements and the ceiling chandeliers/lights. The food option seems too good. Excellent photography of the views around. I would love to stay in such a place at least for a couple of days.